We are the professional Milwaukie Skunk Removal company and can help solve your skunk issues. When you have skunk's living under your house, you usually have to live with the horrible smell that comes along with them. Skunk's will only spray when they feel threatened and as a last resort. 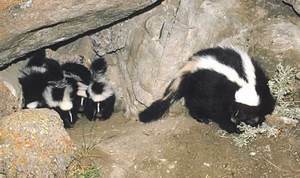 Lots of people do not know that skunk's do not like there own odor as well so if possible they will not spray in there den. Because they are so well prepared for defense, skunk's are a very calm animal unless they are threatened or cornered. They have sharp claws that are perfect for digging under houses, decks, or buildings. The reason they dig under theses structures is to build a den to live and for females, to have babies. Babies are born in spring and sometimes early summer in Milwaukie, Oregon. This time of the year it is important to watch your pets and children if you have a problem because the babies are very cute, but can still spray. If you have a Milwaukie skunk control problem give us a call and we can solve your problem. Milwaukie Skunk Control and Removal Call 503-201-2432!